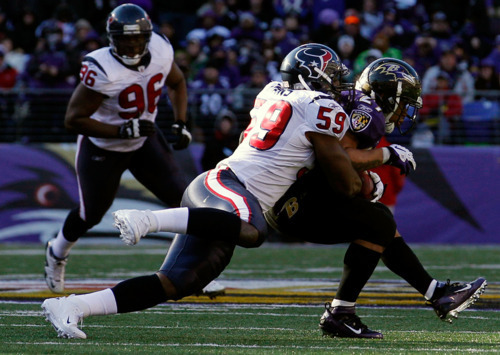 If you’re like me, you haven’t seen many Texans games and you don’t know much about DeMeco Ryans other than by his reputation. Some folks study by watching game film, and I highly recommend you read up for that perspective. My habit is to reach for the stats. The stats, of course, are incomplete. This is especially true when trying to quantifying the production of a middle linebacker. With defensive linemen you can look at sacks. With corners you can look at interceptions and yards per attempt against. But middle linebackers are tough. Largely we look at tackles to tell us about our linebackers, but that’s by far from a perfect statistic. Tackles are influenced by the broader scheme, the intricacies that make even 4-3 defenses different, and the performance of players in front and behind the defense’s middle management. Still, it’s all we have, so we might as well use it up. Jimmy Kempski, that mustachoed maven of the NFC East, wrote a post yesterday in which he pulled “Snaps Per Tackle” from 25 inside linebackers last season. Because of all the factors involved (as well as inevitable inconsistencies in the original data), I wouldn’t blow any one of these numbers out of proportion. 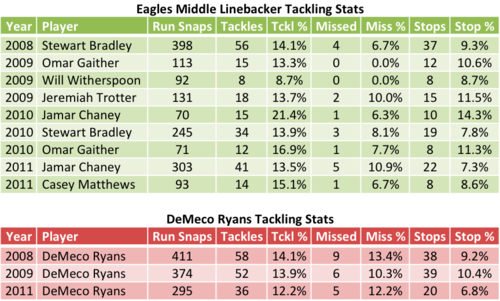 Tackles, missed tackles, and stops all together can give us a interesting look at production. Examining the Eagles stats first though, it looks like stop percentage may be the most relevant stat of the bunch. Tackle percentages are all over the map, and missed tackles can depend so much on just a few plays. But stops — not tackles for a loss, but prevention of a “positive” play — seem to correspond to what our eyes tell us is a good linebacker play. For example, both Jamar Chaney and Casey Matthews scored very poorly in 2011 by this measure, while Chaney’s moments of glory at the end of 2010 account for his high marks then. Looking just at Ryans’s stats, it’s obvious that he had a down year in 2011. Not only did the new 3-4 scheme limit his playing time, but he was less productive across the board on a per snap basis. Ryans’s stop percentage dropped dramatically last year, and is the lowest figure on among all players listed above. Prior to his 2010 achilles injury though, he posted solid, if not spectacular numbers. Missed tackles were really his only run defense problem in 2008-2009. At the end of the day, the numbers suggest some cause for worry, especially about his most recent performance. However, if Ryans can return to his pre-injury performance in a 4-3 scheme, the Eagles have found a very solid middle linebacker going forward. Tagged with Philadelphia Eagles, NFL, DeMeco Ryans, Linebacker, Tackling, Tackles, Stops, Missed Tackles, Jimmy Kempski, Pro Football Focus, Statistics, Jamar Chaney, Casey Matthews, Stewart Bradley.